Within the Lodgify Channel Manager you have two different options to connect to Airbnb; Airbnb Basic or Airbnb Professional. Airbnb Basic will synchronize your availability calendar approximately every two hours and the basic reservation details like the guest name will be imported into your Lodgify Reservation System. These are the main differences between Airbnb Basic and Airbnb Professional so you can decide what fits you best. Find out how to connect to Airbnb Professional. The connection is via iCal, so no instant synchronization of reservations and availabilities. Instant synchronization of reservations and availabilities via API. No import/export of messages. Messages to and from the guest are synchronized between both platforms. No import of the number of guests from Airbnb to Lodgify (number of guests will always appear as 1). The exact number of guests will be imported from Airbnb to Lodgify. Total booking amount is not imported into Lodgify. The total booking amount is imported into Lodgify. Nothing is exported from Lodgify to Airbnb (only calendar availability when the Lodgify iCal is exported to Airbnb). Booking details, as well as property details, can be synchronized and the connection can even be used to create new Airbnb listings with just one click. 12 months of calendar availability and reservations are synchronized. 18 months of calendar availability and reservations are synchronized. Free connection 1% synchronization fee for each new booking imported from Airbnb. 💡 Note: We recommend to use the Channel Manager to import reservations from Airbnb if you use Lodgify as your central reservation system. If you are using another channel as your central reservation manager such as Airbnb or VRBO we recommend to use our Calendar Import / Export Tool to synchronize your Lodgify Calendar with Airbnb. See Export and import your calendar via iCal. Go to your Menu and into Channel Manager. Click on Airbnb Basic. A new slide-in window will open on the right. Click Enable. Open a new browser window and go to your Airbnb account. Then follow the instructions of this Airbnb article to find your Airbnb iCal. Once you have found your Airbnb iCal, return to Lodgify, and click Add Mapping. Paste Airbnb's iCal URL into the textbox, map it to the correct property and save. 💡 Note: Only confirmed bookings are imported using Airbnb Basic, and they appear like direct bookings in your Lodgify calendar (red color for booked). If you wish to create a closed period in your calendar, you will need to create it in Lodgify directly, as it is not possible to import closed periods or bookings from external platforms from Airbnb. Closed periods and bookings from external platforms will still be exported from Lodgify to Airbnb. 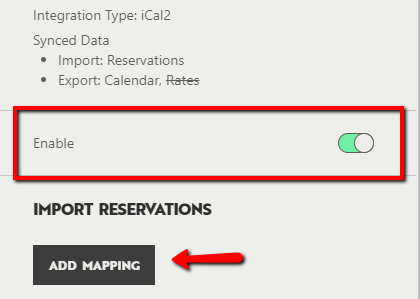 In order to avoid double bookings and synchronize your Airbnb availability calendar with the bookings/closed periods from Lodgify you also need to export this information to Airbnb. Go to the Export Calendar section and copy the iCal link address of the property which you would like to connect. Return to Airbnb and go to the Import Calendar section. Select your Airbnb property, paste the Lodgify iCal URL and give it the name Lodgify and press Import this calendar. Your Lodgify account is now Two-Way Integrated with Airbnb Basic. 💡 Note: It can take a couple of hours until the calendars are synchronized.